While watching a documentary on freshwater eels, I was surprised to learn that European and American freshwater eels are born in the Sargasso Sea and migrate to the freshwater rivers, lakes and estuaries where they grow up. They return to the Sargasso Sea to spawn. 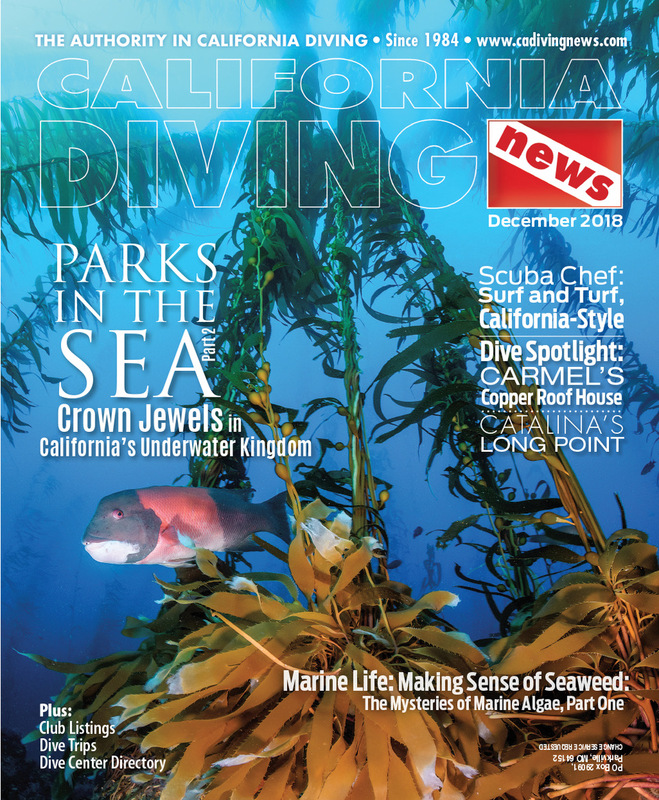 No one knows for sure where California morays spawn. Scientists believe SoCal waters are too cold for reproduction. 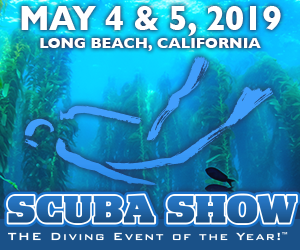 And, since larvae have been taken all along the Baja coast and into the Gulf of California, those are likely the areas where California morays begin their lives. No matter their origin, the transparent, leaf-shaped larvae that hatch from eggs fertilized during spawning bear no resemblance to their parents. These larvae spend as long as a year drifting with other plankton in the water column. They can be four to six inches long before they settle to the bottom and morph into juveniles, possibly resembling the glass eels that are the juveniles of their freshwater cousins. In the final stage of their development morays morph into miniatures of their parents. While two moray eels are found off the SoCal coast, the argus moray (Muraena argus) is rare. I had never even heard of it until Dr. Love mentioned it. The California moray (Gymnothorax mordax) is much more common. Morays are fishes with an elongated body and no pectoral or pelvic fins. They don’t have scales either. Instead, their thick skin is protected from rough surfaces by a yellowish mucous they secrete to cover it. Morays also lack gill covers, which facilitate breathing by forcing water over the gills. Thus, morays must constantly open and close their mouths to breathe. There is a small circular gill several inches behind the eye on each side of a moray. (Gills are not visible in any of the photos on these pages.) Yet another feature that sets morays apart from most of their fish cousins is the ability to swim backwards quickly. And, while morays have an excellent sense of smell, their eyesight is poor. There are some 185 species of moray eels and they range in length from 4.5 inches to nearly 13 feet. Though not the longest, the giant moray is the heaviest, weighing up to 66 pounds. 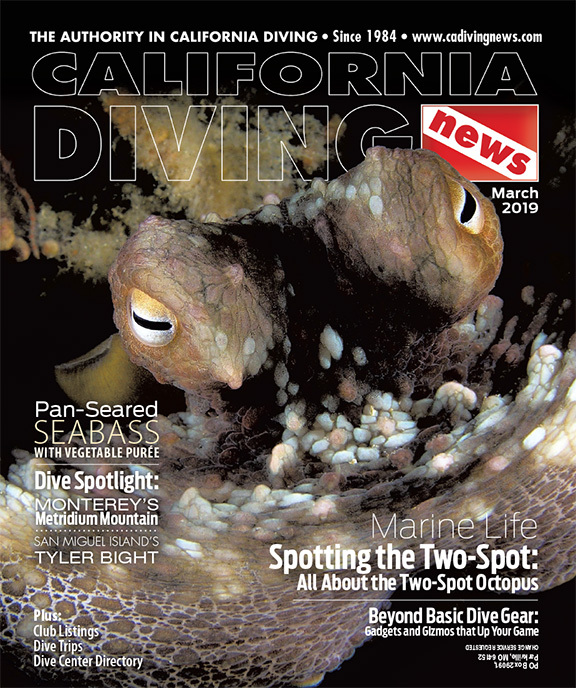 California morays are considerably smaller. They can be five feet long and weigh about 15 pounds. 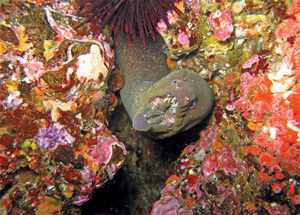 Though they are found as far north as Point Conception, California morays are most common off San Clemente, Santa Catalina and Santa Barbara Islands. What I find curious is their choice of denmates. Although their diet includes crustaceans, they are frequently seen sharing crevices with them. Along with other morays, I have found them cohabiting with red rock shrimp, lobsters and a Panamic arrow crab. Red rock shrimp are cleaners and the beneficiaries of their services do not eat them, allowing them liberties (i.e., perching on their heads and wandering around on their bodies) not granted other creatures. Lobsters and arrow crabs, however, perform no such duties. Apparently, once lobsters reach a certain size/and or their shells harden after molting, they feel it is safe to sleep with the enemy. If they can avoid being eaten by their denmates, they also benefit. Sharing space with a creature that has a mouthful of needle sharp teeth protects lobsters from most if not all of their predators. 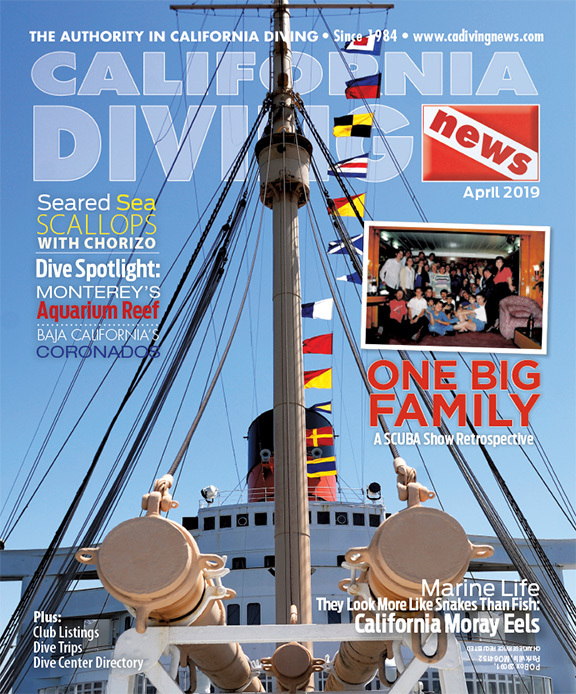 Besides lobsters, shrimp and crabs, California morays eat octopuses, urchins and fish. In the tropical Pacific and the Caribbean, morays are preyed upon by groupers, barracudas and sea snakes. I don’t know of any animal that eats California morays. These eels hunt at night and in all my years of Channel Islands diving I have never seen one out in the open. California morays are found as deep as 130 feet. They can live for 30 years. My most interesting moray encounter occurred off Santa Barbara Island in August of 2011. Captain Glen had anchored the Vision off Sutil Island in late afternoon. I had dived this site numerous times but always in the shallow waters near Sutil. This time Capt. Glen recommended a wall off the stern of the boat, one I had dived decades ago and would have revisited sooner if I’d known where it was. The wall starts in shallow water and I followed it down to about 50 feet. It was beautiful, with lots of Corynactis, a huge, gorgeous, neon green sunburst anemone, red sea urchins and colorful encrusting corals and algae. I didn’t see the moray until I was headed back to the boat. It was hanging upside down in a crevice watching me. Its mouth was closed and I swear it was smiling. I moved closer and positioned my camera. To my surprise, the moray opened its mouth and moved slowly toward me. Its movements were slow and unthreatening. The moray was unfazed by my flash and I shot dozens of photos. We did a little dance the eel and I; it would move forward a little then back up a bit. Its mouth was still wide open when I finally, reluctantly, moved on. I have since wondered: Did it think I was a large cleaner fish? If so, it must have been very disappointed that its patience and benevolence were not rewarded. The author wishes to thank Milton S. Love, PhD, for his help in the preparation of this article. Dr. Love is the author of Certainly More than You Want to Know about the Fishes of the Pacific Coast.